The idea of a full-spec off-road mountain bike sounds great for a little adventure in the countryside. The best of these bikes are built to handle the terrain and allow for some serious outdoor pursuits. The problem is that some people feel as though they aren’t fit enough or experienced enough to make the most of them. That is where an electric mountain bike can help. 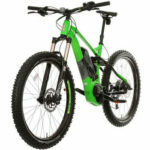 What to look for in top rated electric mountain bikes. The first thing to look at with these models is obviously the way that it generates power to the bike. This means a battery with a decent capacity, a strong motor and sensors to tell it when to start running. The best should allow for a decent speed and distance with no effort from the rider. But, there are other important features for when riders don’t want to rely on this assertive tech. These bikes still need a good frame, reliable brakes and suspension, enough gears and a strong grip on the tyres. 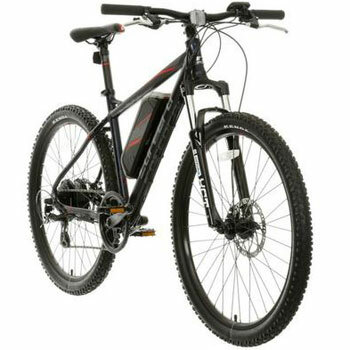 Carrera is one of the leading brands in ebikes because they take the time to blend the electronic tech with some of their best mountain bike components. This allows for a hybridised approach to the product. Users can enjoy the assistive tech that comes from the 417Wh battery, sensor and motor. Users should be able to charge it up in 6 hours and ride for up to 50 miles. This means less able riders can enjoy the countryside with greater ease. Then there are the more traditional elements in the gears, suspension and braking that give the handling and response that they need. 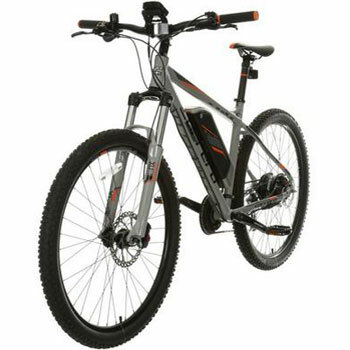 This Carrera Vulcan Electric Mountain Bike has 27.5’’ wheels with a good grip on the Kendra K1027 tyres. There are some high-end components with the 9-speed Shimano gear system, the hydraulic brakes and the Suntour suspension fork. The addition of the lightweight aluminium frame means that users should enjoy good speed and handling. This Gtech eScent mountain ebike shows just how much attention to detail designers can put into these top rated electric mountain bikes. The lithium-ion battery on this eScent model has some impressive features beyond the 36V capacity. The idea here is that riders can go up to 30 miles on one charge. But, this may depend on the use of the environmental eco-mode. There is also a build-in LCD display that warns riders about the status of the charge. When not using the battery, riders can enjoy the full mountain biking experience thanks to a range of great features. 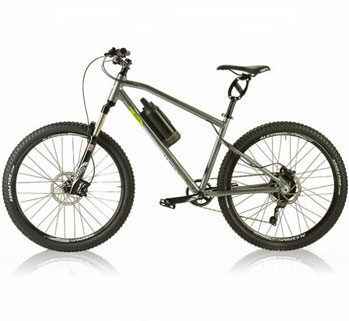 There are 27.5 inch off-road tyres and plenty of Shimano gears to handle the terrain. Hydraulic disc brakes add to the peace of mind when tackling unknown routes. In addition to this, the e-bike weighs just 19kg, which isn’t bad for an electric model. This should help with the handling and long-term use. One of the interesting things about this Carrera range is that they provide pretty much the same electronic system regardless of the model. This consistency in the mechanics means a sense of reliability over the quality of the product. This is a three part system seen in this Vengeance and the Vulcan above. There is the battery, motor and a sensor that allows for communication between the pedals and the motor. Once riders stop pedalling, the motor kicks in. There are some small differences between models, such as the 316Wh battery in this case, but the set-up and connections are the same. The biggest differences with this Vengeance model lie with the mountain bike features and the design. The specification suggests that this model should be a little more capable on the trails than the Vulcan. This is due to the 29er wheels, thick tyre, Shimano braking system and the extra gear on the 10 speed Deore gearing system. Next up is this great looking green and black model from GreenEdge. The interesting thing with this ebike is that the designers don’t appear to have made any compromises. It is easy to neglect some lesser features to focus on the electric elements. Here there is a nice alloy frame, disc brakes at the front and back and the bonus of mud guards and a pannier rack. This last two features aren’t that common in specification. This means that this feels like a more high-end option for serious adventures. The 9ah battery on this GreenEdge CS2 Electric Mountain Bike is powerful enough to keep this bike running for up to 35 miles. The addition of the 250w rear hub motor means reliable assistance as needed, as well as a top speed of 15mph. Riders can also adjust the setting on the pedal assist function to suit their needs. This unisex model has enough here that most riders should appreciate their next journey on the trails. The final model in this guide is this slightly more expensive model from Voodoo. This one stands out a little more because of the shape of the frame and the bold green and black colour scheme. The higher price tag reflects some of the components in the specification. 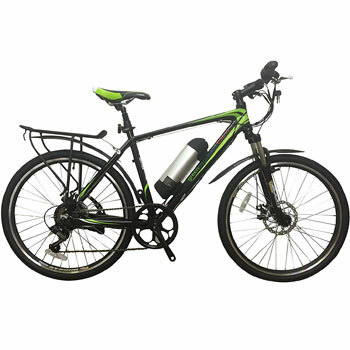 This is a well-designed ebike with full suspension from front and rear 140mm systems, Shimano disc brakes and 11 speed gears. There is also a lightweight aluminium frame complemented by the low position of the motor. It is the little details, once again, that add to the appeal here. Another good example of the importance of those little details comes in the capabilities of the electric system. There is a 500Wh lithium-ion battery and an average top distance of 60 miles. 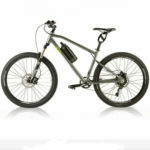 This puts this Voodoo Zobop Full Suspension Electric Mountain Bike ahead of other bikes in this guide. This, the responsive sensor and strong motor all help users go that extra mile. Choosing the right electronic mountain bike for your next adventure. You don’t have to make a choice between a well-designed mountain bike with a simple battery, or a basic bike with great power features. There are some brilliant top rated electric mountain bikes out there that can provide both. You can have a strong battery and smart sensor and still have plenty of gears, suspension and good brakes. The models above provide the best experience for rider when the motor is on or off. Take a closer look at some specifications, get a feel for the style and see what ebike is the best fit.